Slip Opinions: Opinions are first issued as slip opinions. Then, "preliminary prints" of the United States Reports (the official case reporter of U.S. Supreme Court cases) are printed. About 3 years later, once the Court has made its final corrections, the United States Reports bound volumes are printed. The bound print volumes are located on the second floor and are available in PDF on the Supreme Court website. As of March 25, 2019, the most recent bound volume available on the Court's website is vol. 569, October Term, 2012. See the Supreme Court's site for Information About Opinions. The United States Reports is an official reporter and contains the final opinions of the United States Supreme Court. Preliminary Prints are available in print at the Reference Desk and online. 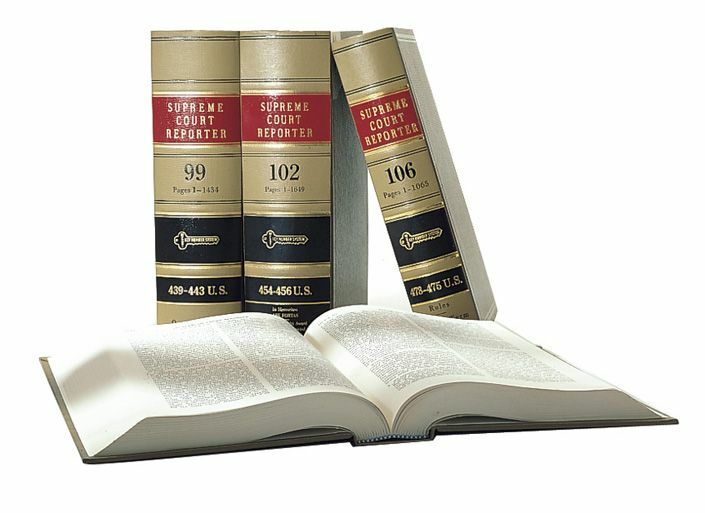 West's Supreme Court Reporter is an unofficial reporter but contains the opinions of the Supreme Court of the United States along with headnotes, Key Numbers, and synopses. PDF versions are available on Westlaw. Lexis's United States Supreme Court Reports (also called "Lawyer's Edition") is an unofficial reporter but contains the opinions of the Supreme Court of the United States along with headnotes, summaries and annotations. Digests are annotated indexes to reported cases, providing brief statements of court holdings or facts of the case. They can be used to locate cases by legal topic or by case name. They are updated by pocket parts and advance sheets. Pocket parts are paperback supplements inserted into a volume's back cover; advance sheets are paperback books printed before the bound volumes are ready. Online versions of the bound and slip opinions of the Court beginning with 1991. PDF copies of official reports from 1754 through current slip opinions. Also includes many historic treatises on Supreme Court history and practice. UC Berkeley's project to preserve web resources cited by SCOTUS and prevent "link rot." The system "determines in near real-time when the Court publishes an opinion and promptly takes snapshots of the web pages it cites." The Free Law Project has scraped all the federal court opinions available freely available on PACER and has posted them online at CourtListener.com. New opinions usually appear in one week's time. Current issues on Reserve (1st Floor); this week's issue available in the Reference Area. Coverage: 1790- ;PDF: vol. 1 to date. Coverage: 1790- .;PDF: 1997 to date. 1975-1978 cases - still in process. **Available to GW Law users while off-campus only. Non-law GW students, faculty, and staff may access Supreme Court opinions on LexisNexis Academic via the Gelman Library. Landmark cases are compiled in a special section. Replaces LexisNexis Academic. ** Law patrons have off-campus access only. The site gives fast, free, same-day access to new opinions. Cornell's complete archive goes back to 1990 and has hundreds of pre-1990 decisions of historical significance. FindLaw's free collection of Supreme Court opinions covers 1893 to date. Select "case law" before running your search. Click "Select Courts" and "Supreme Court." Free, searchable opinions from 1790 to the present. Justia also offers browsing by "Recent Opinions," year, and U.S. Reports volume. This blog is usually the first source of new Supreme Court opinions.